It’s funny. I had a completely different post scheduled to go out tomorrow. Maybe not completely different, but, with a different direction, a different outcome, even though the theme was the same. It had a beautiful shot of the mountains, and a message that was uplifting and gratitude centered; maybe I’ll share it sometime! In either case, it clearly wasn’t what it was supposed to be after the events that followed my writing it. That image up top? It’s actually completely fitting. It’s hard to know where to start sometimes, to figure out who knows what, and what needs to be shared, so now? Now I’m just writing what comes to mind. In my last post, I wrote a lot about where we’ve found ourselves this year. That the (appealing!) offer to move out west wasn’t where we felt led and that the waiting continues; that is still true. Only lately, I’ve started to wonder if maybe we’re waiting wrong…if we’ve still been waiting “conditionally,” even if that’s the opposite of what we’re trying to do. Isn’t life complicated sometimes? This year, we have had more “no’s” than “yes’s!” We’ve had health issues as a family and scares that we didn’t expect (see my last Facebook post. Many of you have and left amazing message, both private and public after I shared it! Thank you!). We’ve also been blessed through each of them, we’ve had both literal and figurative “mountain tops,” but, often, they’ve been mixed in with the hard things. With confusion, with fear, with pain and with other things we wouldn’t have exactly planned for ourselves. Through it all, we have known and still know very clearly that God is a part of this process. That nothing happens that is out of his sight, out of his plan or out of his control. With that knowledge comes a great deal of comfort and acknowledgement of blessings! So, we’ve continued to give it to him. Or, so we thought. Today, out of the blue, after picking up items purchased during a recent shopping spree, the transmission on our car blew. I’m talking stop you in the middle of the road, what do I do now, all my kids are in the car and I’m on a conference call, blew. My first reaction was frustration (as it would be for most people!). Anyway. As the song played, two guys in a pick up happened to show up in the middle of nowhere intersection to push me off to the side. My parents, who happen to have a spare minivan that fits our family, showed up. We were able to call AAA and we’ll figure out the options later. It worked out perfectly, almost too perfectly. Have we been praying for closed doors in order to more clearly see the open ones? Yes. Have we been noticing the little things a little more lately, and staying grateful constantly? Absolutely. But…has there been a little more to it? Sure thing. I think our prayers and desires have still been filled with our own hopes and our own desires for what we consider success. Things that might not align with the hearts we’re supposed to have, or, the plans that we’ve claimed to trust in that are bigger than our own. They’re still ours, even if we don’t want to all them that. I’m not saying our own hopes and dreams are wrong, or that we aren’t supposed to find success. Maybe we are, who knows! But, when our prayers are twinged with those things, and filled with “buts,” are we really praying for hearts that are bigger than our own could ever be? I don’t think so. Are we really giving God room to work? Or still trusting in our own means of finding success? You be the judge, but, I think through all of it, I’m starting to see where I stand. So what’s next? I have no clue. But, I am determined to truly give over control, trust and hopes until they better align with the plan that was put in place long before I was ever a thought to anyone in this world, because only then can true blessings become clear…the fact that we don’t have to have it together or have a plan can be freeing…it doesn’t need to be terrifying. 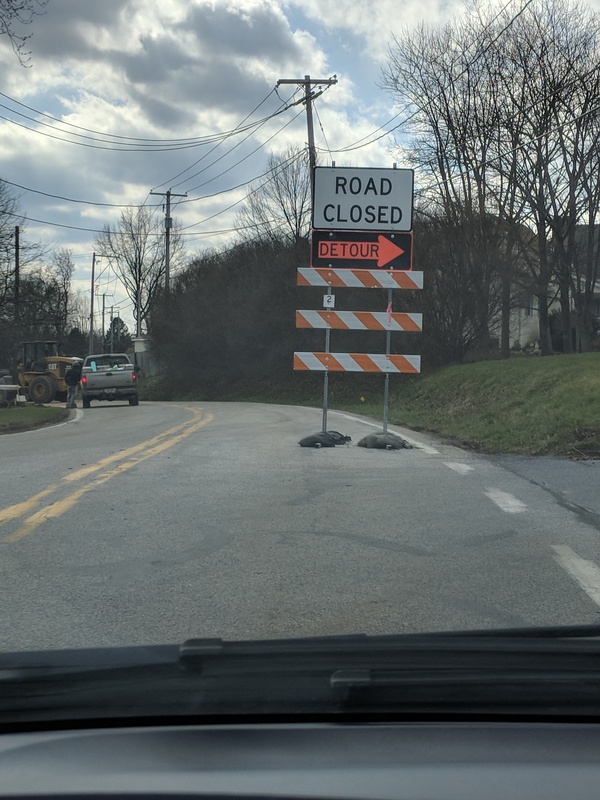 As I was rushing home in the borrowed minivan to beat my oldest’s bus to the bus stop, I came to this sign…on the road that had been open and fine a few hours before that. It came full circle and I laughed/cried/a-little-bit-of-every-emotioned. This is the road we prayed for, and while the road closed signs seem awfully frequent right now, there’s always been a detour. And sometimes, I think that’s where the blessings happen. What a beautiful picture (the hypothetical one…not the one I snapped on my phone before the car behind me started honking!). What detours have you experienced lately? What blessings have you found through them?